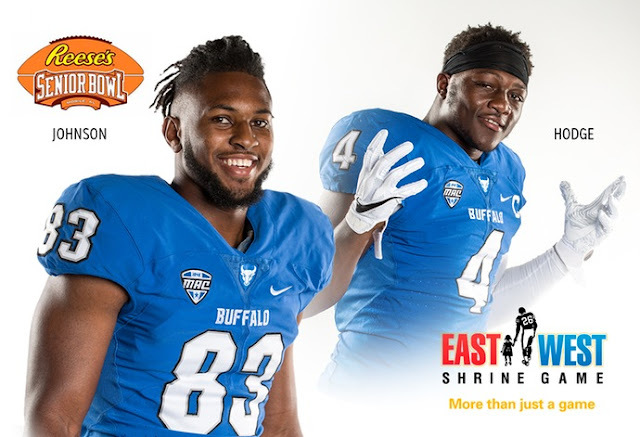 BUFFALO -- A pair of University at Buffalo football players have accepted invitations to play in prestigious postseason all-star games. Wide receiver Anthony Johnson will play in the Reese's Senior Bowl, while linebacker Khalil Hodge will play in the East-West Shrine Game. Johnson will be just the second UB player to play in the Reese'e Senior Bowl, joining former defensive tackle Gerry Philbin who played in the 1964 contest. Johnson is having another stellar season for the Bulls, leading the team with 52 receptions for 944 yards and 11 touchdowns. In only 24 career games, Johnson already ranks fifth in school history in career receiving yards with 2,300 and third in career touchdowns with 25. He is a two-time first-team All-MAC selection. The Reese's Senior Bowl will be played on January 26, 2019 at Ladd-Peebles Stadium in Mobile, AL – the same stadium the Bulls will play the Dollar General Bowl. The game will kick off at 2:30 pm (EST) and will air on the NFL Network. Hodge will be only the second UB player to play in the East-West Shrine Game and the first since former wide receiver Namaan Roosevelt suited up in the 2010 game. A three-time All-MAC selection, Hodge is one of the greatest linebackers in school history. This season, just as he has each of the last two, he leads the team in tackles with 139. In only three seasons, Hodge ranks third in school history with 416 tackles. He is the fastest player in program history to reach 400 tackles. The East-West Shrine Game is played on January 19, 2009 at Tropicana Field in St. Petersburg, FL. The game is scheduled to kickoff at 3 pm and will air on the NFL Network.